The research in our lab has been fortunate to receive a great deal of National and International Media attention, and a few interesting examples are provided below. We adhere to the notion that researchers in any Scientific endeavor should be cognizant of how their work relates to broader issues in human society. 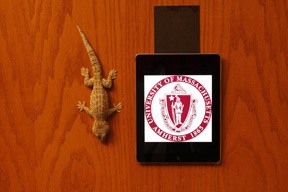 Our laboratory, in collaboration with Al Crosby from Polymer Sciences and John Harris from UMASS Med, have received a $75,000 Life Sciences Moment Fund grant to create new skin adhesives from Geckskin™! Duncan Irschick was awarded the College Outstanding Faculty Research Award by the University of Massachusetts! "Oddball" Science has proven worth say UMASS Amherst Biologists. From the UMASS press release "Writing in a recent issue of BioScience, researchers Patricia Brennan, Duncan Irschick, Norman Johnson and Craig Albertson argue that "innovations often arise from unlikely sources" and "reducing our ability to creatively examine unique biological phenomena will ultimately harm not only education and health but also the ability to innovate, a major driver of the global economy."